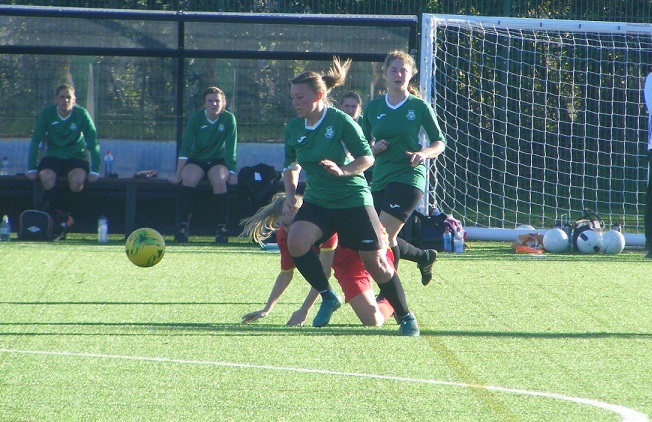 Another top of the table clash from the Suffolk Women’s Division this Sunday on Women’s Football East, the top 2 meeting both starting the season with a 100% win rate, new comers Needham Market Women leading the table hosting East Bergholt United Ladies the defending Champions. 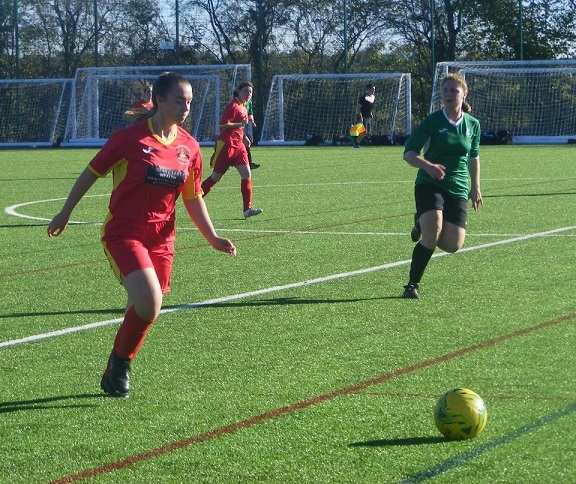 The Suffolk Women’s Division expending this season with an influx of new sides, 13 in total for the 2018/19 campaign with 7 of those new names along with Alresford Colne Rangers who move to the league having previously competed in Essex. Needham Market Women starting by far the better of all the newcomers. 5 wins from 5 to start the season their 100% winning start seeing them 3 points clear at the top from East Bergholt United Ladies and Brantham Athletic Ladies who have both started with 4 successive victories. A part of Needham Market FC’s Academy set up. 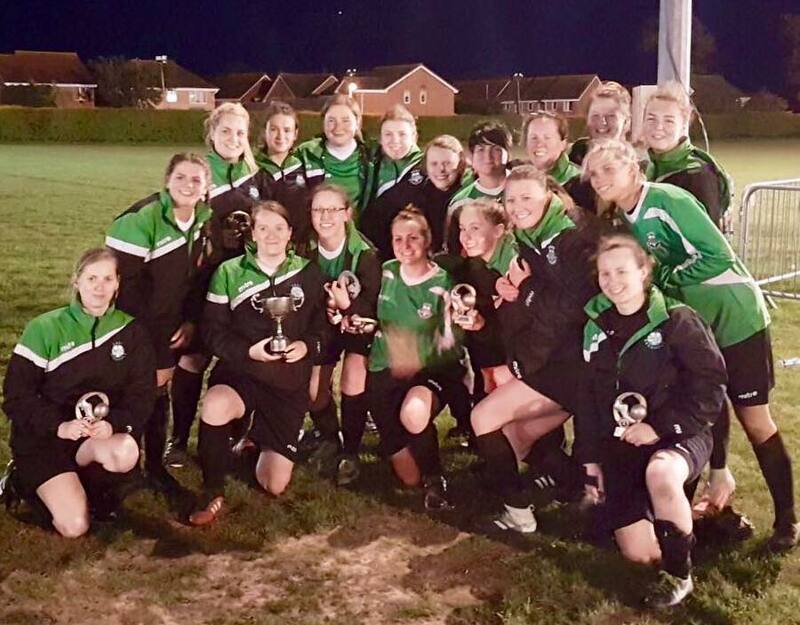 Have bolstered their squad bringing in some ex-Bacton United Ladies players that already have experience playing in the Women’s Division. Today’s match representing the toughest challenge Needham Market have experienced so far. If Needham Market are to get the win this afternoon than they will have to do something no one else has so far this season and that is breach the East Bergholt United Ladies defence. Did the double last season winning the league and cup. An unbeaten season too. A great start to the season as they look to defend their title. Are the team to beat know and that brings a different aspect to the squads development, a large squad backed up by an U18s side. 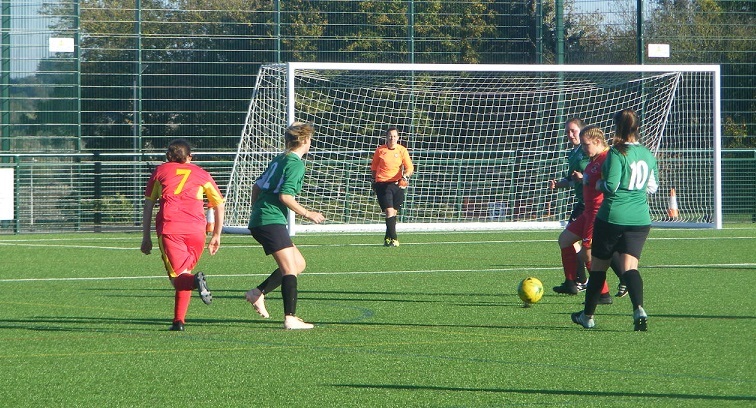 Not conceding a goal in their opening 4 matches East Bergholt United have scored 41 goals up the other end including a 19-0 over new side University of Suffolk (albeit their opponents short on numbers on the day). Always likely to score from midfield have added Stacey Teager to their attack, regularly amongst the goals for former club AFC Sudbury Ladies. Bloomfield’s the venue for this afternoon’s match home of Needham Market FC. The main pitch looking pristine, a clubhouse with bar and hot food leading to it. A new 3G pitch beside the main pitch, a good size, building work ongoing to improve facilities for the Academy. Room for spectators down one side aswell and behind one goal. A glorious sunny afternoon late in October in stark contrast the miserable wet Sunday just gone. Bright sun low in the sky would pose a few issues during the game. 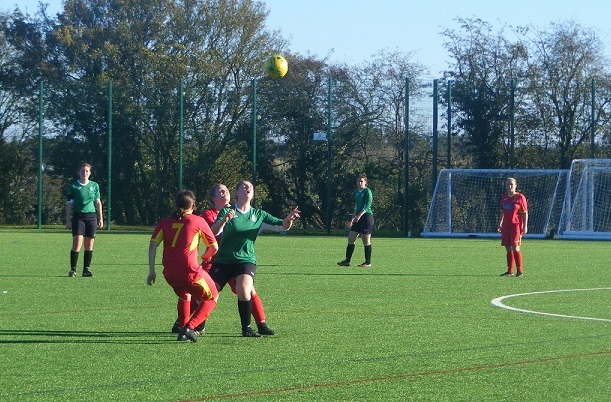 Another game on the 3G before the women’s teams could get onto it and warm-up little time for East Bergholt to get used to the new surface before kick-off. 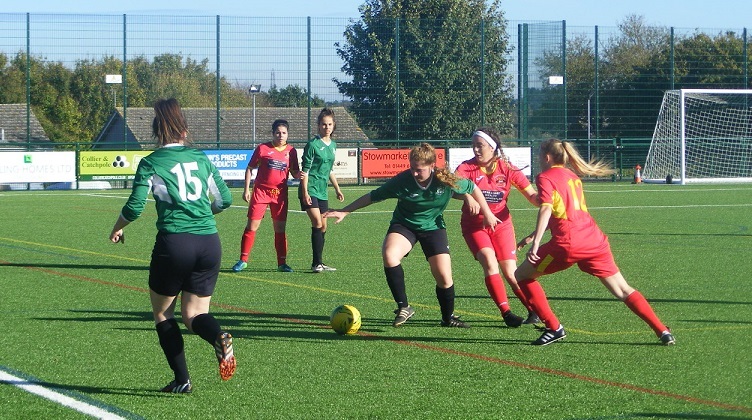 Needham Market Women’s starting XI – Natalie Green, Charley Mussellwhite, Jemma Mortimer, Maria Smith, Megan Stock (C), Isobel Chaplin, Milly Carter, Francesca Rainbird, Eboni-Mae Shepherd, Abbie Wilkinson & Lois Balfour. 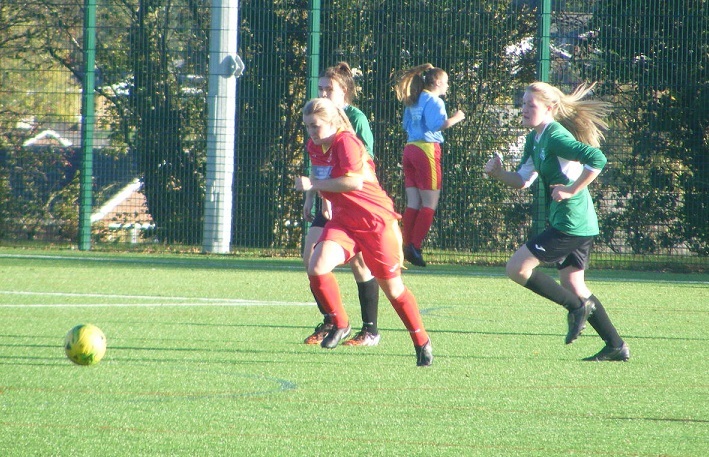 Subs – Jemma Wessels, Megan Davies, Josie Harward & Freya Louis. East Bergholt United Ladies starting XI – Kimberley Lynch, Harriet Meers, Jess Quinsee, Katy Lambert, Georgia Lockerbie (C), Millie Wilding, Jess Clark, Charlotte McGrath, Katie Bruce, India Griffin-Jenkins & Stacey Teager. Subs – Deben Faiers, Elena Nitsche & Isla Romer-Lee. It’s the home side to kick-off the 1st half, Needham Market wearing red shirts with yellow trim, red shorts and socks. East Bergholt United with the sun at their backs 1st half wearing green shirts with white trim, black shorts and socks. 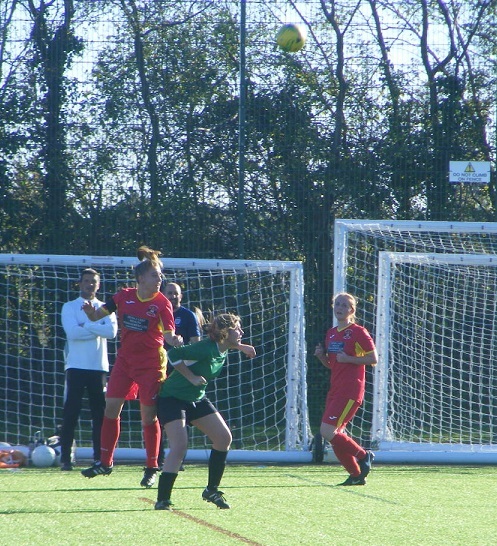 Jess Quinsee defending at left back for East Bergholt as Needham Market look to play in Eboni-Mae Shepherd on the right. Look to get the ball on down the left themselves, Charley Mussellwhite defending putting the ball out of play for Needham Market. Building through the middle the ball up to Abbie Wilkinson, the Needham Market number 10 holding the ball up as midfielder Milly Carter gets up in support to her right the pass into her feet Carter puts the low diagonal ball through to Lois Balfour making a run into the box left of the D the pass weighted perfectly she strikes the ball goalwards past East Bergholt goalkeeper, Kimberly Lynch as she throws herself into the dive the ball strikes the base of the post the rebound back out into the middle of the six yard box, Lynch twisting pouncing on the ball. Millie Wilding makes a run on the right wing the long diagonal pass reaching her taking it down the line no way past Jemma Mortimer as the left back closes her down the deflected ball cut back into the path of Charlotte McGrath as she bursts forwards into the area the sliding challenge coming in as she goes to shoot the ball deflected up and behind for the corner. A good delivery in from the right cutting through the box no one can get a telling touch on the ball to turn it towards goal. 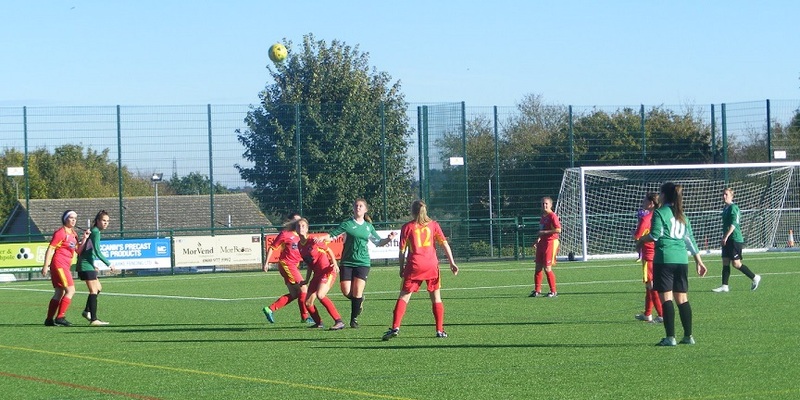 A free-kick awarded to East Bergholt 30 yards out, Jess Clarke over the ball, takes on the shot, the sun at her back, going to be tricky for the goalkeeper, dips late, Natalie Green back on her line as the ball hits her crossbar before going out of play. Good combination play between McGrath and Wilding releasing Stacey Teager down the right channel, attempting to get inside the area is adjudged to have fouled the defender tracking back with her. Francesca Rainbird picks up the ball for Needham Market on halfway a powerful run forwards coming in field from the left looks to try and lift the ball in behind the East Bergholt defence with Wilkinson ready to go, Georgia Lockerbie wearing the captains armband for East Bergholt lifting her leg to make a vital interception. A lively start to the game, Needham Market settling the quicker. Carter getting herself about in midfield winning the ball willing runners ahead of her. Isobel Chaplin sliding in takes the ball as Katie Bruce moves forwards. The ball forwards Wilkinson giving chase, Lockerbie across to tackle for East Bergholt. A change for Needham Market, Chaplin coming off on comes Josie Harward. Lynch’s goalkick is long finding Teager the striker heading the ball on with Bruce making a run in behind her, Needham Market captain, Megan Stock coming over to challenge the ball puts it out for a throw on the left. Megan Stock winning the header for Needham Market. Is a big 3G pitch plenty of space to exploit if players are drawn across, Shepherd puts the ball forwards into the middle, both Balfour and Wilkinson making runs, Katy Lambert intercepting this time for East Bergholt. GOAL! 18 minutes gone and the East Bergholt defence is breached for the 1st time this season as Needham Market take the lead. Pressing the ball in midfield Carter with a pass forwards into Balfour positioned outside the area left of the D, controls the ball shaping to hit the shot on the volley, miscues her attempt, turns into a fantastic assist as the ball rolls on further to the left into the path of Rainbird closing in on goal she shoots, Lynch coming to close the angle gets something on the ball but not enough to prevent Rainbird scoring as she peels away in celebration 1-0. East Bergholt look to get players forwards from the restart, Needham Market break Rainbird on the ball running on left 25 out shapes to shot the ball striking her own player in it’s way through the deflection turning it up and over the bar for the goal kick. East Bergholt build well through the middle Clark with support from Bruce and Indian Griffin-Jenkins before the final pass is slide on through for Teager bursting into the area, a shooting chance denied by the offside flag. The visitors overload the right side players drawn across as Wilding picks up possession squares along the top of the area Teager central can’t bring down Mussellwhite doing well to get the ball clear with Clark free coming in around the back. Changes for both sides, Jemma Wessels entering the action for Needham Market replacing Shepherd. A double change for East Bergholt, Isla Romer-Lee and Elena Nitsche on for Wilding and Griffin-Jenkins. Nitsche straight into action as she is played in on the right taking the ball on cuts the cross back into the box Teager hitting it first time central her effort blocked spins on for Romer-Lee behind her her shot running wide of the far post. Quinsee getting forwards from the back for East Bergholt is tackled by Wessels. The favour returned a few moments later as Wessels tries to get in behind down the wing. McGrath doing well in the middle for East Bergholt breaking up play disrupting Needham Market’s quick build-up play. Clark finding room too for the visitors. McGrath n to put in the tackle winning the ball in the middle puts it long for Romer-Lee down the left a fierce cross fired into the area both Teager and Nitsche attacking it far post both jumping neither can get a touch. 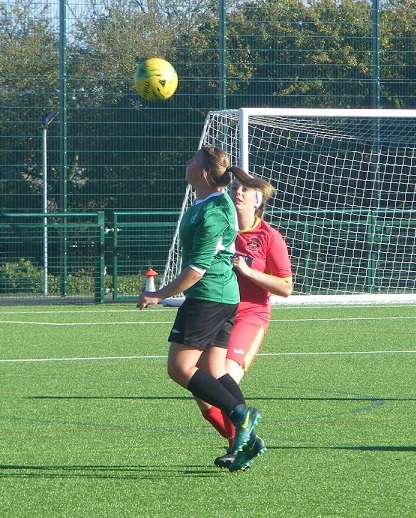 Jess Clark with the header for East Bergholt. East Bergholt finishing the 1st half strong pushing players on, Mussellwhite with good defensive work up against Romer-Lee as she tries to get inside her on the left. Harriet Meers coming inside to support Lambert in defence cuts out Rainbird’s forward pass. Clark in space in the middle spots Romer-Lee breaking into the left channel the ball put on into her run she shoots from outside the area the ball running wide of the post. A competitive 1st half Needham Market starting well an early shot against the post, took the lead on 18 minutes, Francesca Rainbird the first player to score against East Bergholt this season. Pressing the ball took a little while for East Bergholt to settle but signs were building towards the end of the half they were likely to find a reply. Beautifully poised for the 2nd half. East Bergholt to kick-off the 2nd half no changes for either side at the break. East Bergholt starting the 2nd half well pressing forwards, Romer-lee left with Bruce ahead of her picking her out she plays the ball inside to McGrath who releases Nitsche on the right side cutting inside her cross is charged down. East Bergholt keep possession in the final 3rd, McGrath laying the ball back for Clark who takes on the strike from distance the ball landing inside the area claimed by Green. Play stretched even this early in the 2nd half with East Bergholt prepared to commit players forwards Needham Market came counter if the can get the ball into their attackers. Rainbird with the ball left cuts inside a good run plays it forwards for Balfour right side outside the box her cross back in towards the far post as she tries to pick out Carter breaking from the middle, Meers needs to and wins it for East Bergholt. Teager holding the ball up for East Bergholt as players get up to support her McGrath receiving the ball puts on on for Nitsche bursting into the area from the right, Smith doing really well up against her in her own six yard box right of goal as she slides in to deny the shot and put the ball out for a corner kick. A fantastic ball in from the right side the penalty box congested the ball met at the far post Teager I think getting her head on the ball driven in towards goal blocked on the line by Mortimer before being scrambled away for a 2nd corner. Put in towards the top of the area this time is met well by Lockerbie striking it goalwards in through bodies it’s Mortimer to the rescue again her foot stopping the ball from crossing the line. Needham Market pressed at the back get the ball forwards away down the right played into Rainbird making a central run free for a moment aims to drag the ball across her before shooting, Lockerbie recovering well to get back to close Rainbird down the ball spinning away off the defender for a corner. It’s East Bergholt’s time to clear the ball off the line, as the ball in is attacked near post. East Bergholt’s time to break forwards Nitsche right into Romer-Lee central 20 yards out lines up a shot the ball driven in towards goal strikes the bar, Green may well have gotten a touch on it too. Carter getting into an advanced position for Needham Market pulls the trigger from the top of the area right side her effort running low past the far post. Good running from McGrath coming right on for Nitsche down the line a good cross into the six yard box claimed well by Green before Romer-Lee can attack it running in from the left. Teager coming deeper for the ball turns putting it on for Nitsche right side cuts into the box, Stock getting back with a good tackle stops her. Clark over a free-kick for East Bergholt as the referee brings play back with no advantage, 30 yards out central, Clark takes on the shot her attempt over the crossbar. Nitsche a threat on the right for East Bergholt making good runs has the ball at her feet lays the cross back into the middle for the advancing McGrath striking the ball from 20 yards out it bounces out wide past the far post. Needham Market are under pressure pushed back getting the ball forwards into their attackers isn’t easy. Lambert intercepting an attempted through ball. A change for East Bergholt, Bruce coming off Wilding coming back on. GOAL! The equalising goal has been coming East Bergholt have been turning the screw comes from a strike from distance, Clark onto the ball, sends an effort in towards goal, Green trying to get to it can’t keep in out 1-1. East Bergholt press straight from the restart winning the ball, drive on, Teager onto the ball a powerful run towards the box, Stock doing very well up against her. Clark with another opportunity to have a shot at goal from a set-piece a free-kick awarded 25 yards out right of centre, curls a shot in looping towards goal, Green getting across to it pushes it behind conceding the corner. GOAL! No sooner have they equalised then East Bergholt go on to take the lead in the match the goal coming from the corner on the right an inswinging ball is defended on the line by Needham Market pushed out into the box the ball comes to Lockerbie positioned at the top of the area just inside she meets it well driving the ball back in and this time no-one cane stop it as it nestles in the back of the net 1-2. East Bergholt on top pressing the ball in the final third Needham Market with their backs to the wall defending deep a corner given away on the left. In towards the near post Lockerbie gets on the end of it headers over. Teager strong on the ball is fouled inside the D, Needham Market slow to close her down. Teager to take it as Clark is otherwise indisposed the striker putting the ball over. The visitors looking strong now as Needham Market struggle to regroup after falling behind. McGrath on for Wilding central attempts to loft the ball in towards the far post area with Romer-Lee making a run the ball going away from her out of play. GOAL! East Bergholt press their advantage enjoying a purple patch add a 3rd goal attacking on the left the ball lifted forwards into the box with Nitsche racing in behind through the middle six yards out the ball landing in front of her holds off a defender opening her body to side foot the ball wide of the keeper and score 1-3. Needham Market make a change, Chaplin back on coming into the defence with Smith pushed on into the midfield. Need to get forwards Carter on the ball, Rainbird and Wessels offering support on the left the ball helped on Wilkinson flagged offside. Into the final 15 minutes. Wilding shooting from distance central the ball safely held by Green. East Bergholt make a change Nitsche coming off, Griffin-Jenkins back on. Needham Market attack getting forwards well right side the cross fired in near post Rainbird there to attack in Mussellwhite doing well closing her down. Balfour twisting and turning with the ball through the middle finds half a yard to shoot from 25 yards out her attempt dropping wide of goal. Harward comes off for Needham Market, Shepherd back on. A throw on the right for Needham Market inside the East Bergholt half put into Wilkinson she turns and shoots from outside the area Lynch down low to gather at her near post. The game has taken alot out of both side, East Bergholt are tiring late on have been intense in the 2nd half, Needham Market pushed back come forwards now play stretched Rainbird getting forwards to support Balfour on the left, Meers across to defend for East Bergholt. GOAL! The ball kept by Needham Market on the left brings the home side a 2nd goal, Rainbird putting it back up the line as Mortimer gets forwards to support the fullback playing it inside Rainbird in the meantime breaking into the box is seen the pass cutting open the East Bergholt defence, Rainbird throws herself at the ball her lunge putting the ball wide across the keeper an in to the back of the net 2-3. Not much time left but Needham Market have found an extra reserve of energy with the goal the game is open now having been pushed back for much of the 2nd half the home side press forwards risk getting hit on the counter sense they might be able to yet to get something from the game. Rainbird their main threat her ball in from the left cut out by Lockerbie. Quinsee bringing the ball out from the back for the visitors however he forward pass for Romer-Lee sees the flag raised. Is some tired defending at the end East Bergholt have put alot into the 2nd half, Wilkinson driving on, Lambert closing her down. the visitors counter Romer-Lee left side her cross into the area deflecting off Mussellwhite falls for Teager back to goal lays it off for the onrushing Wilding connects with the ball 20 yards out the effort whistling over the bar. The last action of the game East Bergholt making it 5 out of 5 go top of the table. Is a 3 ways tie at the top now East Bergholt with the superior goal difference, Needham Market taste defeat for the first time this season whilst Brantham Athletic Ladies receive a home win to keep up their 100%. 13 teams in the league however a long way to go. An entertaining contest played with some enjoyable late October sunshine. Needham Market starting well taking the lead 1-0. East Bergholt building momentum late in the 1st half kept going 2nd half pressing the ball in the final third shooting from distance got level then very quickly took the lead, Needham market slow to respond the visitors going further in front, Needham Market getting a goal back late on but East Bergholt went on to claim the 3 points. The defending champions looking good after 5 games, know there is still a long way to go. Needham Market showing plenty of potential will only get better. Time for this afternoon’s Women’s Football East – Player of the Match. Sometimes a contender will emerge early on in a match and it’s a case of seeing if they maintain that level of performance. 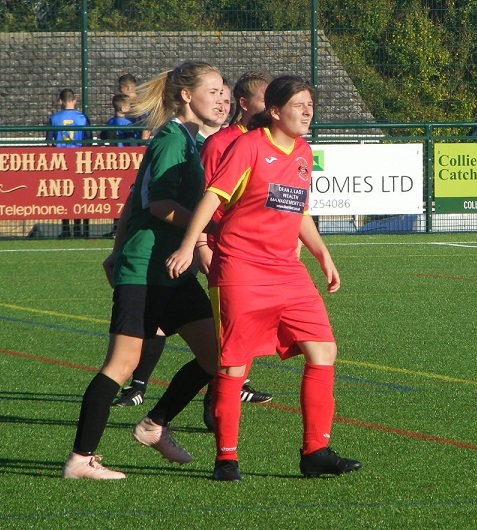 There were two this afternoon that caught the eye both for East Bergholt and it was a tough decision picking one out over the other, getting forwards into space and a threat from set-pieces Jess Clark stood out getting a goal too. Just edging it though for me was central midfield partner Charlotte McGrath. Played well throughout winning the ball getting across the park, setting up others and offering support with some well timed runs through the middle today’s award goes to the East Bergholt number 10. An enjoyable trip out to Bloomfield’s this afternoon, the bright sunshine no doubt helping a good crowd in attendance too. Is a great facility and by the looks of the development will only get better. My thanks to both sides for their help with the teams always appreciated. 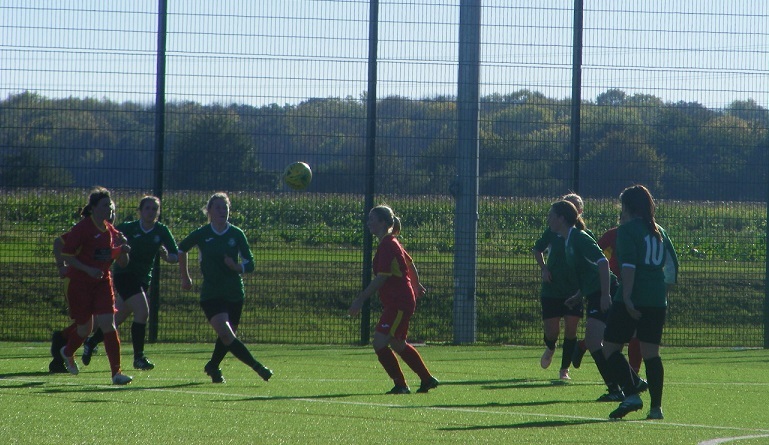 This entry was posted in Match Reports, Suffolk Women's Division and tagged East Bergholt United Ladies, Match Report, Needham Market Women, Suffolk Women's Division on October 21, 2018 by WFEast.